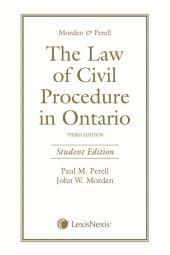 Covers civil procedure in Ontario from preliminary considerations to appeals of motions, applications and actions and provides readers with knowledge of the litigation process in the Superior Court of Justice and the Court of Appeal for Ontario. The Honourable John W. Morden, C.M., B.A., LL.B. (Toronto), LL.D. (L.S.U.C)., D.S.L. (Trinity College, Toronto), was a member of the Rules Committee from 1974 to 1999. He also chaired the Special Sub-Committee of the Rules Committee, which, following on the work of the Williston Committee, prepared the Rules of Civil Procedure for Ontario (1980–84), the Civil Rules Committee (1990–99), and the Criminal Rules Committee (1990–99). Mr. Morden was appointed to the High Court of Justice of Ontario in 1973, and served on the Ontario Court of Appeal from 1978 to 2003. From 1990 to 1999, he was the Associate Chief Justice of Ontario. He was counsel for Heenan Blaikie in Toronto from 2004 to 2014. From 1999 to 2004, he taught Advanced Civil Procedure at the University of Toronto as an adjunct professor. The Honourable Mr. Justice Paul M. Perell, B.A., LL.B., LL.M, Ph.D., was a member of the Secretariat of the Civil Rules Committee for the Court of Appeal for Ontario and the Superior Court of Justice from 1985 to 2006, as well as Chair or Co-Chair of the 1995 and 2002 Law Society of Upper Canada Special Lectures. He was an adjunct professor at the University of Toronto and Osgoode Hall law schools. 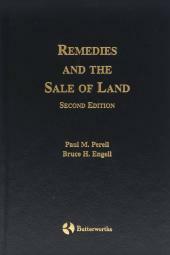 Mr. Justice Perell was appointed to the Ontario Superior Court of Justice in 2005. Before that, he was a partner at Weir Foulds LLP, where he practised in the areas of civil litigation and legal research and writing.